Mold, a various type of fungi that grows in filaments and reproduce by forming spores, can be found just about anywhere in your facility given the right conditions. The HVAC system drain pans is a common spot and should be on a regular inspection and maintenance program in an effort to reduce the mold’s impact. Drain pans are located under and downstream from system cooling coils. As air passes through the coil, moisture in the air condenses and accumulates in the pan. When the system is operating properly, the pan collects and rapidly drains away all condensate. Unfortunately, the system does not always operate properly. If the flow rate across the coil is too high, condensate can be carried downstream from the pan, soaking the ductwork and creating an environment in which mold can grow. Condensate drain pans can also become plugged with dirt, overflow and soak duct interiors as well as surrounding areas. Condensate pans can corrode through, allowing water to flood areas under the air handler. To minimize the chances of mold growing as a result of condensate problems, ensure that the pan is properly installed to allow drainage. The pan should be inspected and cleaned regularly to prevent dirt from accumulating and blocking the drain line. 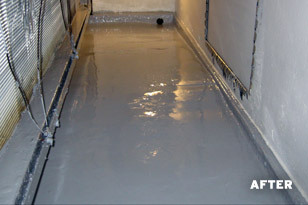 The pan may require refurbishment and an AQUIS product is great for this application. AQUIS offers the only available solution that delivers compliance to both NFPA 90A and ASHRAE 62.1 standards. 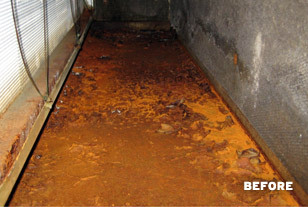 Before the mold invades your drain pans contact Continuum Services at 248.286.5200 or info@continuumservices.com.